MotionSavvy looks like it’s one of those apps: as it is designed to read your sign language motions. The all-deaf, 6 person team behind the application utilized the Leap Motion accelerator AXLR8R, which was designed to recognize 3D motions, to recognize hand motions. MotionSavvy’s primary function is to translate American Sign Language into English; it can also do the reverse. Let’s say you want to communicate with someone who is deaf, you can speak or type your message and motion savvy will translate it into a series of animated American Sign Language gestures. 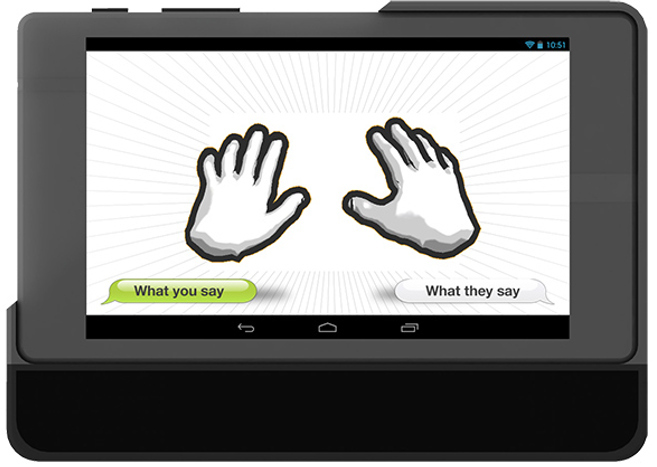 If someone wants to use ASL to send a message to you, they’ll perform the gestures in front of the tablet, which will then convert the message to either voice or text so you can read or hear what they’re telling you. The application does have a ways to go, as it currently only understands 100 words, but the developers believe that they will be able to crowd-fund enough resources to flesh out MotionSavvy enough to cover not only the extensive ASL vocabulary, but also the different ways in which it used, or “accents” if you will. So far, 800 testers have signed up for the beta, and the MotionSavvy team believes that they’ll have a product ready for consumers by September 2015. As for a price point, the team is aiming for a $600 product: a windows tablet and a $20 per-month subscription for the software. The eventual goal is to develop applications for iOS and Android platforms, so users can use MotionSavvy on their phone or tablet of choice. What do you think of the tech? Do you think that MotionSavvy has a great idea on their hands? Or would you want to see how it works before you sing its praises? In any event, it definitely seems like a product that could have the potential for a lot of good.